Central Pillar and the 3 x 3 Number Square. In the featured picture the corner numbers on the Lo shu are 4,9,3 and 5. Remaining 5 remaining numbers are called the gnomon. These five are 2,7,6,1, and 8. There are three more possible corner/gnomon arrangements. That can be a subject for future blogs. The Tree of Life uses this one arrangement on the central pillar: The upper left corner v. its gnomon. Here are some instructions on how to read and compare the two systems. A vanished civilization knew what you are about to read. They enjoyed a Golden Age until they succumbed to a worldwide cataclysm. 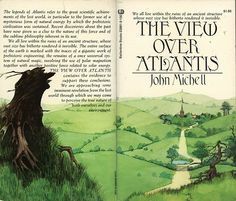 Certainly, Plato’s account of Atlantis fits this description. Allusions to this lost culture are found in the survival of ancient measurements. Below are a couple of my internal links. 5500 year old Temple in Malta. My treatise called “Sacred Engineers’ Philosophy: The Pinnacle of Thought in the Unified Culture of Ancient Builders.” is placed at a triangle’s center that defines the megalithic yard. On the number square, multiply the numbers of the upper left corner: 4 x 5 x 9 x 3 = 540. Multiply the gnomon numbers: 2 x 7 x 6 x 1 x 8 = 672. Multiply the Central numbers of the four emanations (circles):1 x 6 x 9 x 10 = 540. This duplicates 540 product of the upper left corner of the number square. Take the central pillar numbers again. Add them: 1 + 6 + 9 + 10 = 26. Square 26 as 26² = 676. This is not the 672 gnomon product above. However, by rules of gematria, one can be added to each word or factor, in this case- circle, without essentially altering its meaning. We have 4 circles on the central pillar. Thus 672 + 4 = 676. We have congruence again. Gematria is explained in great depth by my favorite author, John Michell. His books are extremely rare and difficult to come by. The book that started me on the journey of lifetime. Godly Circle Diameter 66/ Circumference 207. 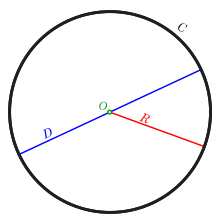 A circle (black), which is measured by its circumference (C), diameter (D) in cyan, and radius (R) in red; its centre (O) is in magenta. A circle is a simple closed shape. It is the set of all points in a plane that are at a given distance from a given point, the centre. It is the curve traced out by a point that moves so that its distance from a given point is constant. How the ancient four elements structure the circle: Four elements were known in antiquity. They were recognized through the Middle Ages: (1) Earth (2) air (3) fire and (4) water. In the 21st century, we laugh at this. After all, we know there are 92 re-generative and re-occurring elements. But in the process, we have overlooked a lost and long fogtteen code: The 4 basic elements of organic chemistry are carbon, hydrogen, nitrogen and oxygen. These are the actual elements behind the enigmatic, alchemical four just listed. Our air is comprised of mostly nitrogen, atomic number-7. Nitrogen accounts for 78% of the atmosphere, oxygen is second in size with 21%. The hardest earth substance is diamond. It is consists of compressed carbon. Carbon’s atomic number is -6. By atomic weight, our water is mostly oxygen Water’s formula is H2O. One atom of oxygen has 8 protons and 8 neutrons. Two hydrogen atoms only have 2 protons, i.e. one per atom. An atom of oxygen is approximately 16 times heavier than an atom of hydrogen. The atomic number total of the chemical four elements is: 1 + 6 + 7 + 8 = 22. Twenty-two, by the four elements, goes around the zodiac three times. Thus, 3 x 22 = 66. The three tenses of time in Hebrew equate with 66. This is by the ancient rules of gematria. Look this term up on Wikipedia. (2) “Am” (present) (hei-vav-hei) with a gematria of 16. (3) ” Will be” (future) (yud-hei-yud-hei) with a gematria of 30. The total of the three tenses becomes 20 +16+ 30 = 66. We have just seen how both the “elements” and time are equated with 66. Space and time, in this manner, equate with #66. 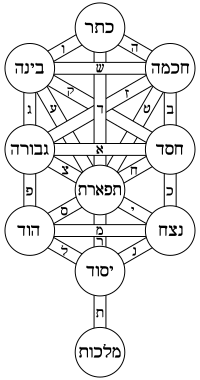 The Hebraic parallel is The Tree of Life. It has 10 emanations that are depicted as circles. As mentioned, at one time letters and numbers shared the same symbol, The Hebrew word for circle( ( galgal) equals 66. Hebrew is written right to left. Gimmel (1st letter) = 3; lamed (second letter)= 30. Since these letters are repeated (as pictured) in the Hebrew word, galgal, 2 x 33 =66. So where is the 207 Godly circle circumference 207 of diameter 66? By tradition, what is not pictured on the Tree of life is En Sof. It is conceived as being over the highest emanation- the Crown. Ein Sof, or Eyn Sof (/eɪn sɒf/, Hebrew: אין סוף‬), in Kabbalah, is understood as God prior to any self-manifestation in the production of any spiritual realm. Ein Sof may be translated as “unending” or infinity. As spelled in Hebrew , אין סוף‬, has a numerical equivalent of 207. “Sof” means ending. In nature everything transforms. When something ends. something new begins. If we make the 66 value for the word circle, into a diameter, the circumference becomes 207. Number 66 also identifies a key road in the U.S.A. Is this merely a co-incidence with the zodiac? Binary Code and Perfect Numbers on Tree of Life. I learned of this on Oquaga Lake. First of all, perfect numbers are few and far between. Six is the first such number. Then comes 28, 496, 8128 and 33550336. If you take these lower perfect numbers to the 10th power, you get squared, higher perfect numbers. Then, these perfect numbers can be expressed in binary fashion: They display ones and zeros. See examples below. In number theory, a perfect number is a positive integer that is equal to the sum of its proper positive divisors . This excludes the number itself. Also below is an illustration of how six is a perfect number. Two perfect numbers are easily found on the Tree of Life. The circles are called emanations. Look at numbers 6 and 10 on the central pillar picture below. The heart of the Tree is emanation “6”. Six is 1st perfect number. The name of emanation 10 is Malkuth. What is relevant here is the name of this 10th emanation. This is because in Hebrew letters doubled as numbers. The name for this occurrence is gematria. It is a Greek word. The Hebrew letters of Malkuth equate with 496: The mem = 40. Lamed = 30. Kuf = 20. Vav = 6. Tet = 400. Add them as 40 + 30 + 20 + 6 + 400 = 496. Also, when you take the perfect numbers to the 1oth power, you get the squared version expressed by ones and zeros. See illustrated above. In this way 6 and 496 binary potential. This trait is shared by all perfect numbers. Emanation 10, spelled with Hebrew letters equals 496. That is the 3rd perfect number in the series. i.e: 6,28, 496. Opposite polarities, as follows, total 1100. Take the two outside pillars. Look at the numbers 3 at the time. Reverse their polarities as follows: Left pillar = 358. Right pillar = 742. Next add them as 358 + 742 = 1100. This figure balances binary by two positive (1) and two negative (0) glyphs. Reverse this pillar multiplicity as 853 + 247. You get the same total- 1100. This number becomes the gateway to the Tree of Life. Where Else is the 1100 Binary Code Found? 1100 gives expression to a lost antediluvian binary code. It once structured a Golden Age. The code is still common around the world. However, very few know how to read it. It is called the 3 x 3 number square. 440 and 660 are prominent in this code. They total 1100. Below is the picture with the source for the Tree of Life. These numbers are on any of the 7 solutions. The bottom displays the traditional. Finding the 1100 code on the Tree of Life at its Source. Add the numbers around the perimeter. Do it two at the time overlapping as follows: 49 + 92 + 27 + 76 + 61 + 18 + 83 + 34 =440. For the 660 do the following. Add the numbers in groups 2 as follows: (49 + 61) + (35 + 75) +( 81 + 29) = 330. Each subgroup totals 110. Using the same method of addition, do it vertically. You also get 330. Add the two: 330 + 330 = 660. Finally, add 440 + 660 = 1100. Here’s the icing on the cake: The Tree of Life and the Great Pyramid demonstrate various ways the 3 x 3 number square works. Music is based on the interval of a perfect fifth. It is also born of this number square: E=660 v/s. A=440 v/s. The notes of the perfect fifth vibrate in this 3/2 ratio. A number of posts on DSOworks.com describe the technique. I sensed it was an Indian spirit around the lake of the Lennie Lenape tribe that taught me. I was the house piano player at Scott’s Oquaga lake House. 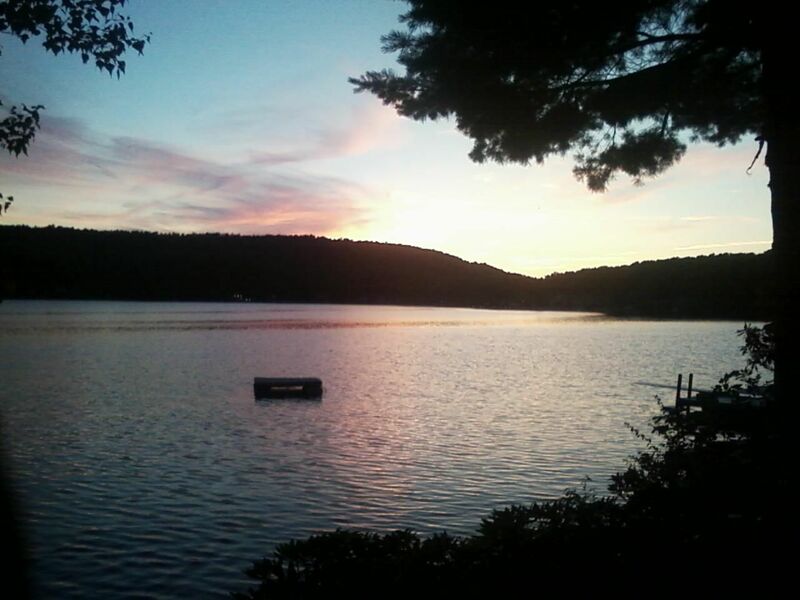 On countless Lakes in upstate New York, many sense harmonious, spiritual presence. 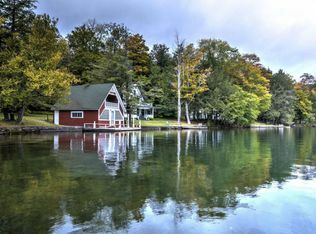 Above is Oquaga Lake in Summer. Mysterious Diameter Measure at the Hopewell Circle. The city’s name is derived from its original layout created in 1810. This was within the 1,100 ft diameter of a circle. The circle was a Hopewell tradition earthwork dating to the early centuries of the Common Era. The county courthouse was built in the center of the innermost circle. The circular outline was soon obliterated. By the late 1830s a group of citizens decided to changed the layout to a standard grid. This was accomplished by the mid-1850s. All traces of the Hopewell earthwork were destroyed. However, anyone with specific knowledge of the past can link the circle to prehistoric times. Conclusions are quite startling. The intent of the original and now destroyed circle at Circleville, Ohio can be reconstructed. Map of Circleville’s early layout within the preset circle. More modern courthouse is at the center. I have a particular interest in Circleville. On June 2 2018 I gave a concert at the Circleville High School. The story of the concert is nothing short of miraculous. Shortly, a youtube video of the concert will be posted. Keep checking my posts for the link of the actual concert. Also, please read about the incredible story of the concert on the internal link below. The question becomes: Why is 1100 feet a mysterious diameter measure? What profound secrets does it hold? Basically, its measure explains lost secrets from a former and now lost civilization. A secret code in the diameter measure is to be found in the Hebraic Tree of Life. It illustrates another secret code that is prominent on the 3 x 3 number square. These secret codes can open the gates that lead to a Golden Age of Peace and Plenty. Reverse the numbers. We still get 1100: 753 + 247 = 1100. The prime number square is also the most complex. This is the traditional arrangement of the numbers. Add the numbers two at the time. This is explained below. 660 and 440 will appear. Add these two numbers: 660 + 440 = 1100. 440 is another major characteristic number on the square. Here is just one way it uses 440: Add the numbers around the perimeter two as the time. Go either clockwise or counter clockwise. You get 440. For example: 49 + 92 + 27 + 76 + 61 + 18 + 83 + 34 = 440. Try the other way.
. The Hopewell tradition refers to the common aspects of the Native American culture. It flourished along rivers in the northeastern and midwestern United States. Years were from 200 BCE to 500 CE. The Hopewell tradition was not a single culture or society. It was a widely dispersed set of related populations. They were connected by a common network of trade routes. The routes were called the Hopewell Exchange System. How far back can we trace the use of number squares? Was Plato correct in his relating the story of Atlantis? Are the American Indians the long lost tribes of Israel? The point is: Every question, when answered, simply raises more questions. Keep checking DSOworks.com. More events and posts will be in the making. Ancient Divine Path Fits the Pythagorean Theorem. First, what is the theorem? The Ancient Divine Path requires number squares for interpretation. Number squares are a key part of many ancient religions. The basic number square was 3² + 4² = 5². The “octave” (numbers doubled) expression becomes 6² + 8² = 10². The 10 x 10 number square invoked emanation #1 on the Tree of Life. Any 2 opposite numbers equal 101. 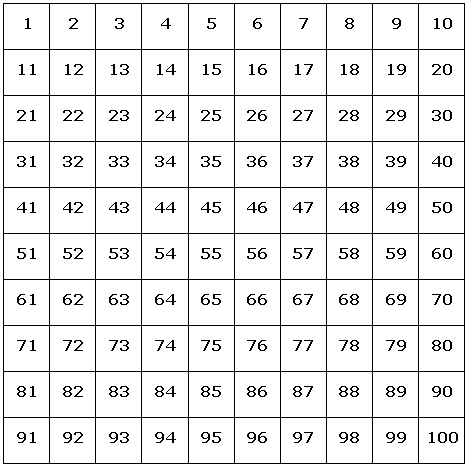 Here is but one example of how Judaism uses number squares. Many religions also use them. In ancient languages letters and numbers shared the same symbol. This was called by a Greek name, gematria. Judaism calls on the qualities in the above heading through the first 12 Hebrew words of the most sacred and key prayer: The Shema Yisroel. Shema Yisrael Adonai Eloheinu Adonai Echad. Hear O Israel, the Lord is our God, the Lord is One. Blessed be his glorious kingdom forever and forever. בָּרוּךְ שֵׁם כְּבוֹד מַלְכוּתוֹ לְעוֹלָם וָעֶד. Now, refer to picture of Tree of Life above. Those who have been reading the blogs on DSOworks.com already know how ancients had the same symbol for both numbers and words. The formula for figuring out the sum any row of numbers on a number square (as per Rabbi Aryeh Kaplan) is the sum of the numbers in any row, cubed + plus the total number of numbers in that row, then divided by two. This is found in Kaplan’s Meditation and Kabbalah, p.163. “Love” invokes the 13 x 13 number square Thus, the characteristic number of Chesed-Love is 13 x 13 x 13+ 13/ 2 = 1105. The first 6 words of the Shema total 1106, as spelled above. One was allowed for the presence of the Blessed Name. The characteristic number of Netzach-Victory is 2465. As 17 x 17 x 17 + 17/ 2 = 2465. The total of the entire 12 words of the Shema is 2464. Again one is allowed, by tradition of colel, for the presence of the Blessed Name. The ancient divine path is all about number squares. When realized, finding the way to emanation #1 comes with a map. Here is the equation: 8² + 6² = 10². The journey requires intense effort. That is the essence of squaring numbers. We start the journey from Hod (8) -pictured above. We must bend from the path on the left pillar of severity (pillar defined by 8,5, and 3). Then travel in the direction of mercy on the right. If we don’t make the effort, trouble comes from being harsh and severe. Mercy, on the other hand, is found to the right on the tree. From emanation 8, on the left, we must travel toward emanation 6 (Tifereth). As pilgrims in search of love, mercy and compassion, we are then able to travel straight up to emanation #1. When we learn to become kind and forgiving, we bend away from rigid severity on the left. We can embrace mercy. In this way we can finally be at one with our Creator. The Pythagorean equation”: has meaning on many levels. It is coded by number squares and by emanations of the Tree of Life. Outstanding Number Ten is in the Next Dimension. The Italian mathematician Fibonacci (c. 1170–1250) is credited with introducing the decimal system to Europe He used the term zephyrum. This became zefiro in Italian. It was then contracted to zero in Venetian. The Italian word zefiro was already in existence (meaning “west wind” from Latin and Greek zephyrus). It may have influenced the spelling when transcribing Arabic ṣifr. Why did it take zero so long to become independent? Because for 1000’s of years civilization was based on a prime 3 x 3 number square. Notice no zero exists in the square. It is simply the numbers one to nine. They are arranged so that any row of three totals 15. Also, any two opposite numbers total ten. Ten is a synthetic number on this square. Also, if you read my other blogs on DSOworks.com, you can see other possibilities for this square of numbers. The square given below was the preferred setting of antiquity. Maximum separation between (1) yang and yin (10) on the Tree of Life. Here is a depiction of the Tree of Life. The 10 emanations are represented by circles. The 22 paths are the lines. Notice, emanations one and ten are separated by the maximum possible distance. They represent yin (10) and yang (1) at odds with each other. Likewise, on the 3 x 3 square ten must be constructed by the effort of arithmetic. Ten represents a challenge to arrive at, either way. The best way to acquire at knowledge of 10 is through the wisdom and rhyme of the Oquaga Spirit. I she is a female from the Lennie Lenape. The Moon was saying good-bye. In size they were like twins. In daylight each other did not smother. What to be made of this? Finally, to enjoy more of her poetry, here is a 14 minute sample from the products page on DSOworks.com. I have memorized the entire book and am available for poetic recitations. Ten eighty Billboard is on the Tree of Life. Pardon my quoting the title of Billboard Magazine. That being said, the blog is about 1080- not the hot 100. However, I thought it made a nice feature picture. First, what is a billboard? A billboard is a large outdoor advertising structure. It is typically found in high-traffic areas. Busy roads are preferred. Billboards present large advertisements to passing pedestrians and drivers. They typically showing witty slogans and distinctive visuals. Billboards are often highly visible in the top designated market areas. Reference to 1080 is found in 3 places. At first glance, there is no 1080. Rather, we simply see the numbers 1 to 10 in the ten circles. Ten eighty on the Tree of Life billboard is hidden by invisible ink. It is also known as security ink. Invisible used for writing. It is invisible either on application or soon thereafter. Later be made visible by some means. Invisible ink is one form of steganography. An octagon has 8 angles totaling 1080 degrees. The Tree of life is outlined by 8 circles. They are circles 1,3,5,8,10,7,2, and 4. Circles 6 and 9 are contained within the octagon. The overall shape forms a type of octagon. Eight angles of any octagon total 1080°. Next, look at the heart of the “Tree”. It is called Tifereth. It is emanation six. Tiferet (“Adornment”, Hebrew: תפארת is the sixth sefira in the kabbalistic Tree of Life. It has the common association of “Spirituality“, “Balance“, “Integration“, “Beauty“, “Miracles“, and “Compassion“. Could this be what Buddha meant by the eightfold noble path? Eight paths lead to Tifereth. Count them. We thus have an inner octagon around the heart. Here is our 2nd 1080. Next out third 1080: The Hebrew word for Tifereth is : תפארת. In Hebrew letters double as numbers. At one time there was no separate number system. Tav is 400. Pei is 80. Aleph is 1. Reisch is 200. Tav is 400. Thus, 400 +80 + 1 + 200 + 400 = 1081. One, the alpeph, present the center or presence of the One God in the 1080. Here’s a quick summary and a few facts: Iron has 26 protons, 26 electrons and 30 neutrons. Its atomic weight is 56. For he identity of the element of iron at Stonehenge, read the above internal link. Then I will demonstrate the same pattern in the Tree of Life in the featured picture. Incidentally, number 26 is the numerical equvalent of “Yahweh” as spelled with Hebrew letters. In many ancient languages, letters doubled as numbers. This was called by the Greek name, gematria. Stonehenge, the Tree of Life and magnets share “numerical personalities” of iron. This equivalency would equate God with a fundamental force of nature as magnetic. Now look at the featured picture. First, the two vertical outside pillars:Multiply the 1st two horizontal numbers on the outside pillars as (3 x 2). Then add it to the opposite pair pf (5 x 4). Total is 26. Next take the central pillar. Add its four numbers as 1 + 6 + 9 + 10 =26. Twenty-six, as the numerical essence of God, infuses the Tree of Life. Found in these two distinct ways, we number protons and electrons in iron. Next, multiply the last two extreme horizontal numbers as 8 x 7. We have 56. That is the atomic weight of iron. For the 30 neutrons, simply subtract as 56 – 30 = 26. Look once more at my internal link. The circles around the central 5 stones of Stonehenge duplicate these numbers. Stonehenge, the Tree of Life and an atom of iron have number sequences stemming from the 5 x 5 number square as pictured in the link. “So what?”, you might ask. I believe a new Golden Age can be initiated by the realization and activation of traditional number squares of antiquity. A Golden Age is marked by peace and plenty. Burning Bush Also Represents the Tree of Life. This blog presents a surprising co-incidence. The emergency symbol for fire is the same as the Hebrew letter for “shin”. This letter actually represents fire in Judaic traditions. It can have either a “hissing” sound, like the word “history”. Or, it can have a “sh” sound as in the word, “short.” The difference depends on the placement of a vowel dot. Both sounds imitate fire’s sound. This letter is most sacred. It represents two names of God. 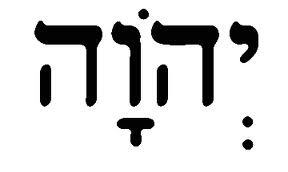 They are Shaddai שדי‎ meaning “Almighty”, and Hebrew: שָׁלוֹם‎ shalom. Hebrew is written from right to left. Shalom, unlike Shaddai, can have multiple meanings: They include- Peace, harmony, wholeness, completeness, prosperity, welfare and tranquility. It can be used idiomatically to mean both hello and goodbye. The Hebrew letter “shin” is now an international symbol for fire. We can readily see how life’s fulfillment comes with with “Shalom”. To acquire “Shalom” is to reach the top of the mountain-just like Moses. It becomes all the sum of all the desirable fruits of life that we live for. For meditation I suggest the following: Slowly, repeat “sha” 5 times. The “ah” sound releases the tension of the “sh”. Meditate on this release. The ending “om” sound of “shalom.” Repeat this sound five times. Then say the entire word five times. May all the blessings of “shalom” be with you. Our second major point is about the Tree of Life. Shin and the burning bush are symbols for this tree. Its depiction also provides a format for meditation. It too, has the overall shape of the letter, shin. You can see the 3 vertical pillars. Horizontal and diagonal paths connecting them become illuminations. The letter “shin” in Hebrew. It has three primary branches. Mystical Overlap, Number Squares & Tree of Life. Adam and Eve ate from the Tree of Knowledge of good and evil. They were expelled from the Garden of Eden before they could eat from the Tree of Life. 17th-century depiction of a Tree of Life in Palace of Shaki Khans, Azerbaijan. Study the blogs. 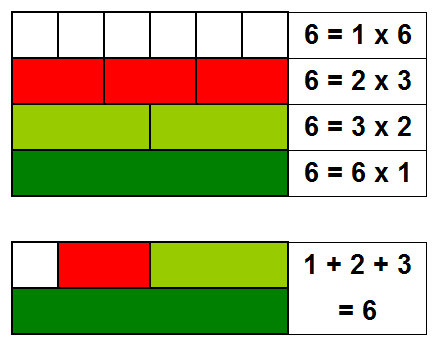 Learn how the 3 x 3 number square works. This was known at least 11,000 years ago. Here’s how it applies to the Tree of Life. On the number square below, 10 is a synthetic number. It is feminine. Ten is passively created when two opposite numbers are added. For example, 4 + 6; or 3 + 7. As such it receives. In antiquity this was called the feminine principle. 1100 is a sum that is hidden on the 3 x 3 number square. It is the sum of 440 + 660. Briefly, Add the perimeter numbers by double numbers in either direction. Overlap starting with upper right to left: 49 + 92 + 27 + 76 + 61 + 18 + 83 + 34 = 440. Now overlap two at a time either horizontally or vertically. You get 660. So, 49 + 35 + 81 + 94 + 53 + 18 = 330. Then from the other side: 29 + 75 + 61 + 92 + 57 + 16 = 330. Then horizontally, 330 + 330 = 660. Finally, 440 + 660 = 1100. That is the numerical total to the entry of the Tree of Life in Paradise. Take our synthetic number of 10 as described above. Add this to our numerically derived 1100 number from the 3 x 3 number square explained above. 1100 + 10 = 1110. This is another key number on the 3 x 3 number square. For example, 492 +618 = 1110. Or, 951 + 159 = 1110. A profound measure is now revealed. The perimeter around the Great Pyramid of Egypt is 1110 megalithic yards. This is a well known measurement. Documented sources are on some of my blogs. Conclusion: The passageway back to the Tree of Life in Eden is by way of the 3 x 3 number square. Unity of sciences and arts was once known through the Neolithic use of number squares. Above expresses musical fifths.